Welcome to The Rime Buddhist Center’s Fall curriculum. This semester you will have the opportunity to receive teachings from Geshe Lharampa Tsewang Thinley the Drepung Gomang Geshe in Residence at the Rime Center. Also we are continuing with the second half of the Tier 2 classes. Look for details below on these exciting opportunities to deepen your practice with the support of fellow practitioners. All classes meet on Wednesday and Thursday evenings from 7:45-9 p.m., with an optional meditation session from 7-7:30 p.m.
Class and text fees are listed with each class. Use the links in the titles of the class to register for the various classes online. Otherwise print out the registration form and bring it with you to the class. If you have questions about a specific class, please contact Lama Matthew Rice (Lobpön Palden Gocha) by email at spiritual.director@rimecenter.org. Meditation has been proven to: lower blood pressure, relieve stress, and help you cope with anxiety. It has also been shown to be very effective with chronic pain, insomnia, and panic disorder. The wonderful thing about meditation is that it can be used anywhere, even on the way to work and has no dangerous side effects. In this one session class you will learn this simple technique that can change your life. This class is based upon the work of Jon Kabat-Zin of the Stress Reduction Clinic at the University of Massachusetts Medical Center. Class Fee: No class fee, donation suggested. 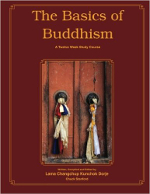 Have you always wanted to understand Buddhism? Buddhism is a 2,500 year old tradition that teach us how to end pain and suffering in ourselves and others. This 12 week course will cover: meditation instruction, the life of the Buddha, basic Buddhist teachings, the three schools of Buddhism, and much more. This class is for anyone who is contemplating on taking the refuge vows. Taking the refuge vows is generally considered to be the doorway to the learning and incorporating the Buddhist tenets into one’s life. The aim is to provide the student with the understanding the what, why and how before making the commitment to take the refuge vows. Time: 7:45 – 9:00 p.m.
Bodhichitta is the indispensable prerequisite for achieving non-abiding nirvana and is the fusion of the skillful means of compassion and the wisdom of emptiness. It arises in the mind through repeated training in the four boundless attitudes, whereby a person’s thoughts and actions are transformed into the path of the Mahayana. This class will focus on understanding each of the four boundless attitudes; compassion, loving kindness, joy, and equanimity. The class will also look at understanding what Bodhichitta is and how one cultivates it in our practice. All the Buddhas of the three times-those who have come in the past, those who appear at the present time, and those who will come in the future – when on the path of learning, listen to scriptures that set forth the six paramitas. They reflect upon their meaning and train in them on the path. In their example this class will focus on the study of the four precepts of aspiration bodhichitta, and the six paramitas of bodhichitta in action. 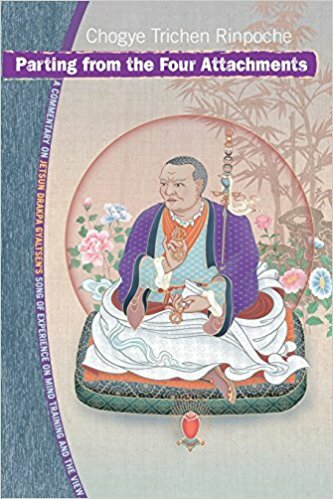 In this final class for the Tier 2 series of classes we will be studying the famous Sakya text Parting from the Four Attachments by Sachen Kunga Nyingpo. This text incorporates all the practices of the path of the Mahayana in a succinct instruction. The text shows us that if we truly want to be Dharma practitioners and to benefit sentient beings then we must relinquish our attachments to this life, to saṃsāra, to our own self-interest, and to self-existence. No need to register in advance for the Dharma Discussions with Geshe Thinley. We are asking for a suggested donation of $5 person session. 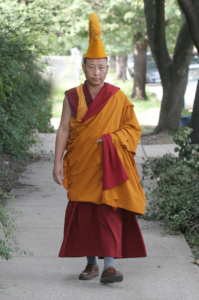 These classes are designed so that Geshe-la has the occasion to teach on various topics of Tibetan Buddhism, while not being restricted to any particular book or topic. These classes will be set into three four week blocks that you can sign up for. This is an amazing opportunity to study closely with someone as knowledgeable as Geshe Thinley. Becoming an official member of the Rime Center demonstrates your support of the Center. In addition, members receive benefits, such as discounts and invitations to special “members only” programs. The four half-hour sessions cover the following topics: 1. Introductions, and over view of Tibetan Buddhism; 2. What does it mean to be Rime; 3. The organizational structure of the Rime Center and explanation of the center’s outreach programs; 4. Program Events and service opportunities – along with a tour of the Rime Center. Upon completion of the classes, students are inducted as new members of the Rime Center sangha and are given a mala personally blessed by H.H. Dalai Lama. Taking refuge in the three jewels is a strict prerequisite for any kind of relationship with the Buddhist teachings. The objects of refuge are the: Buddha, Dharma & Sangha (also known as the precious triple gem) grant protection to the spiritual seeker. The refuge ceremony is when one “officially” becomes Buddhist. The act of taking refuge is a declaration of one’s intention to follow the Buddhist path. The format will consist of two teachings sessions and ending with the refuge ceremony. As part of the refuge ceremony one is also given a new refuge name. At the end of the service we will have a potluck so please bring dish to share. Class Fee: No fees, but dana (donation) to the teacher suggested. This entry was posted in Classes by Lobpon Palden Gocha. Bookmark the permalink.